Whether you’re seeking to move house, require a transport vehicle for commercial purposes, or looking for a temporary truck while your other one is being repaired, Mobile Truck Rental provides affordable truck hire solutions to residents throughout Newcastle. No matter where you happen to be situated, we can have a 3 tonne Pantech truck delivered to your doorstep at a moment’s notice, at a time that is convenient for you. The biggest advantage of hiring a 3 tonne truck is that anyone with an ordinary car license can drive one. There’s no need for an MR or above qualification to operate one. Whether you require a hire truck for removal purposes, warehousing or any other application that involves the transport of large items, our fleet of hire vehicles provide a cost-effective method of accomplishing your task. When you’ve decided to rent a truck to transport your possessions with the help of a mate or two, you need to know that you’re calling upon the services of a respected truck hire company that has an impeccable track record for Do-It-Yourself removals. Our 3 tonne pantechs are decked out with a trolley, rope and rear tailgate lifters to make loading and unloading as easy as possible for you. It’s no secret that having to pay a removalist to transport your belongings is a frightfully expensive ordeal, even if the journey is only a short distance. Whilst you could choose to do things the old fashioned – not to mention expensive way to transfer your possessions, you could instead choose the more sensible option and elect to deliver the items there yourself, saving yourself a small fortune in the process. Our hire trucks are decked out with everything you need to safely and efficiently transport your valuables to your required destination, in total comfort, no matter where you are in Newcastle, for up to three people. To discover more about our rental trucks, please refer to our truck info page. 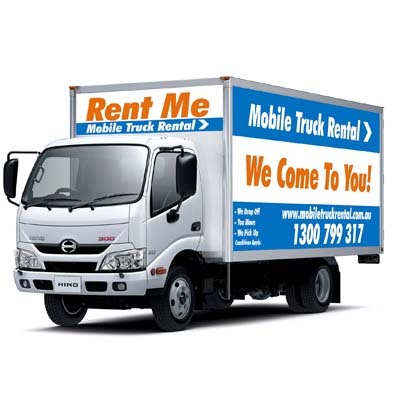 At Mobile Truck Rental, we make Newcastle truck rental affordable. Our vehicles are all immaculately clean, well maintained, regularly serviced and come fully equipped with all the gadgets you need to perform your transport duties in total comfort. Competitive rates with no hidden charges. One of the greatest irritations typically facing those who deal with other truck hire businesses is their inflexible terms of lease. At Mobile Truck Rental, our friendly team of knowledgeable professionals will ensure that you select the most suitable class of truck for your specific tasks and set up a quick and easy contract that is sure to save you money. At Mobile Truck Rental, long term truck hire is a specialty of ours. Whether you need a hire truck for three days or thirty, we can tailor a bespoke rental agreement that meets your specific needs. Unlike many other vehicle rental companies that demand delivery of your vehicle to a local rental yard, once you’ve finished with it, at Mobile Truck Rental, you don’t have to worry about any of that. When you’ve finished using the vehicle, we come and collect it straight from you, saving you time, additional travel expenses and excess kilometres on your rental vehicle. For more information, please refer to our Long Term Deals page. Whether it’s for personal or business purposes, avoid paying outrageous sums of money to have a removalist do your transporting work for you. Do the smart thing and hire a truck. You’ll be saving yourself a small fortune by doing so and our super convenient service ensures that you don’t have to waste time and money driving to the rental site to collect your vehicle or driving to another one when you reach your final destination. We do the collecting for you. We drop your hire truck off at your specified address and we collect it from you once you’ve finished using it. It’s that simple. For a free quote, contact the team at Mobile Truck Rental, the leaders in Newcastle Truck Hire.